A few weeks ago Peanut and I were getting very frustrated with each other because she wanted to wear her town clothes around the house to play in (anyone else have this problem?). I realized she was having a hard time differentiating between the clothes she could wear at home and those that she could wear when we go out. It was then I realized she needed a different system to organize her clothing than the one I had originally created for her. 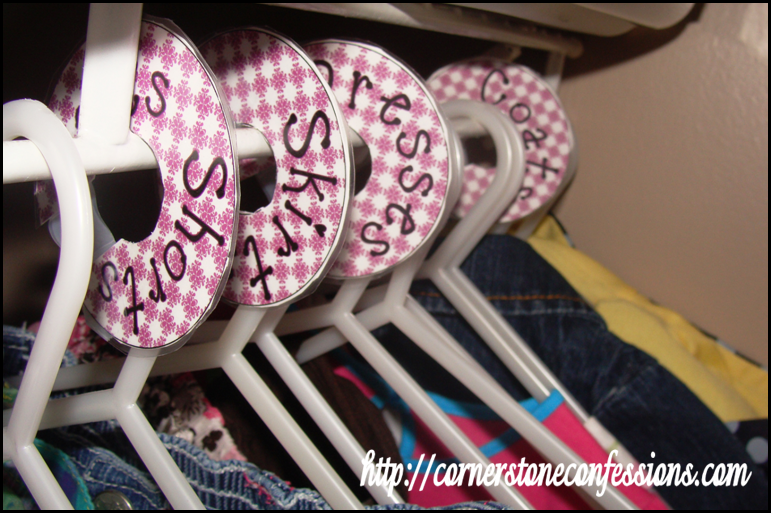 So we created some new labels for each occasion instead of by clothing type similar to what I created for my clothes closet. The result has been fabulous. She now not only knows which clothes she can wear when, she can easily put away her laundry by herself too. Talk about a time saver. In fact, Peanut liked them so much I made an extra copy for Teacup who has also taken to the new labels because they have pictures on them (why didn’t I think about that before?). All that to say, today you can download the labels for your closet or children’s closet too, if you desire. And, since I know not everyone likes pink as my daughters do, you can also download the labels in red too! Just click the appropriate image below to download your copy. I recommend printing the labels on card stock and then laminating them before using. Enjoy and happy organizing!